The following story is from the National Compendium of 4-H Promotion and Visibility on the National 4-H History Website at http://4-HHistoryPreservation.com/History/4-H_Promotion/ . 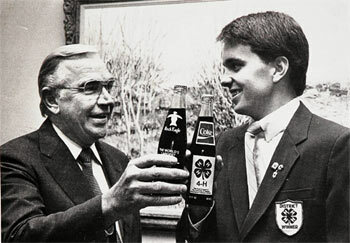 In 1984-85, 4-H’ers in Georgia were selling Coke bottles as part of a fund raising campaign. However, these were no ordinary Coke bottles. The bottles read, “Rock Eagle: The World’s Largest 4-H Center, 30 Years of Service to 1,000,000 citizens of Georgia 1954-84.” The front of the bottle flashes the 4-H emblem – a 4-leaf clover, just below The Coca-Cola Company logo. The 96,000 special bottles were printed by The Coca-Cola Company as part of a five-year fund raising program to raise $2 million for the renovation of the 4-H camp and conference center in Eatonton. The 4-H’ers were selling the Coke bottles for $1 donation, or more, at county fairs, harvest sales, grocery stores, convenience stops and school stores. Don Keough passed away on February 24, 2015 at the age of 88. This entry was posted in History and tagged 4-H History, 4-H Promotion by Larry Krug. Bookmark the permalink.